Tivo and Amazon cut out the need to use a PC from their video download service earlier this week. Tivo equipped users can now buy downloadable movies straight from their remote controls if their DVR is hooked up to a broadband Internet connection. Microsoft similarly cut out the PC for movie downloads when it enabled a PC-free movie rental service through its Xbox gaming platform and website Xbox Live about a year ago. At the video gaming industry’s leading trade show in Santa Monica, Microsoft and Disney announced a deal to expand the titles available on Microsoft’s service. 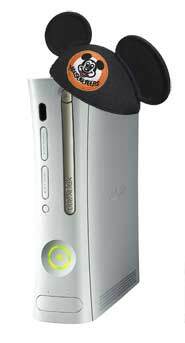 About 11.6million Xbox 360 consoles have been sold worldwide since 2005. Approximately seven million of those gamers use Microsoft’s free online service Xbox Live. On the service, 179 Television shows and 192 movies from several studios have been available (not including the new Disney titles). Under the new deal, 35 Disney titles will be added. Using the service Xbox 360 owners equipped with a broadband Internet connection can download movies newly released on DVD in high definition format (720p with 5.1surround Sound) for about $6. Lower resolution, or older titles, are available at reduced prices. Unlike buy-based download services like iTunes, the Xbox service is a rental model. The on-demand rental nature of the service means customers will have 14 days from download to watch the films before they are erased from the consoles hard drive. Movies on Xbox Live are rented with “points” which are purchased online or in gift cards available at retailers. There is some volume discounting associated with points so the exact price of a download is difficult to pin down. An HD download is 480 points for new releases and 360 points for older titles. Microsoft has earned approximately $125m in revenues for rental downloads since the service was launched (that number also includes game rental downloads). The Disney titles from Disney owned studios: Walt Disney Pictures, Touchstone Pictures, Miramax Films and Hollywood Pictures will periodically change as new releases become available.